Happy Monday! After a delicious weekend, I'm back with some more recent foodie finds! 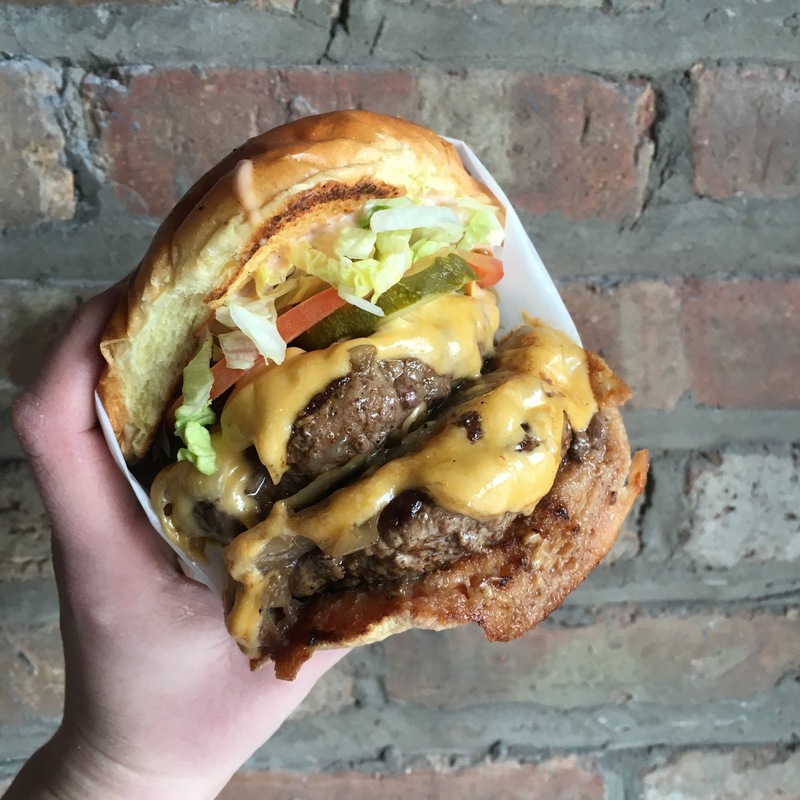 There's a brand new deli in my Lakeview 'hood called Snaggletooth, and they're doing some pretty fabulous things. 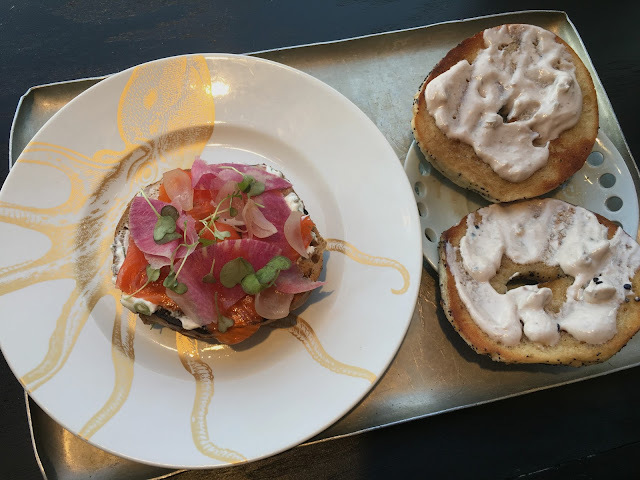 Snaggletooth is a cute two-level cafe near Southport and Diversey that specializes in house-cured fish. I stopped by on opening day with the BF and luckily we got there before 11 am, because they were only open from 9-11 am since they ran out of food! Totally understandable. I loved their interior touches, including the original mosaic floor. The menu includes tartines, salads, grain bowls, sweet breakfasts, and bagels and schmear from their schmear bar. You can also order house-cured fish by the 1/4 pound. The BF ordered an everything bagel (they gave him a poppy seed bagel though) and topped it with honey walnut schmear. The bagel was griddled on the sliced side, but the outer side was a little rubbery. The schmear was tasty but had a runny texture. I'm not sure if it was just sitting out too long or what, but most of the schmears had a similar appearance. 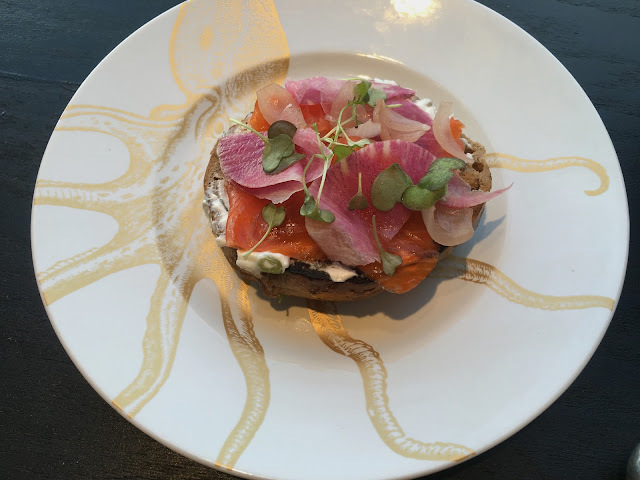 I ordered what can be called the most Instagram-worthy bagel, the trout lox tartine (OK it's really not a tartine, it's a bagel with toppings). The bagel was topped with scallion schmear, watermelon radish, smoked cippolini onions, and trout lox. This bagel had the same issue as the BF's, but other than that, I enjoyed the balance of flavors and textures. The fish was very tender but I really wanted it to have more flavor. One major plus is they serve Sparrow Coffee (my fave). 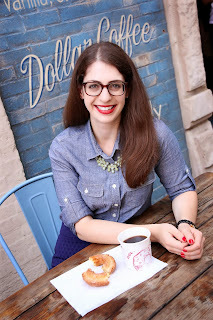 I was disappointed to hear they don't make their own bagels (they get them from New York Bagel & Bialy), especially since we have very few decent bagel options in the city, let alone in Lakeview! I want to give Snaggletooth another chance since I did go opening day and they definitely deserve a second look. I will say, their prices are not cheap, but neither is high quality fish. I'm giving Snaggletooth 3.5 ghosts out of 5. Have you heard the news? 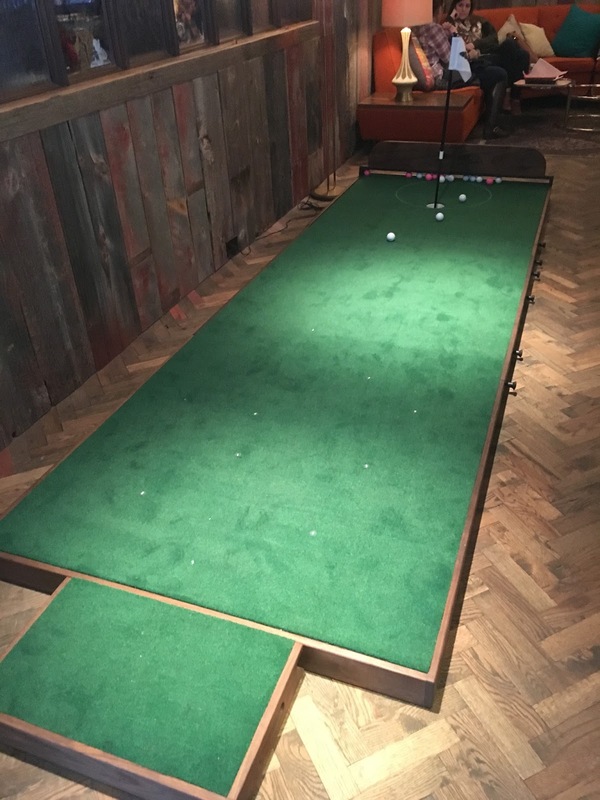 25 Degrees recently opened a second location in Wicker Park near Division and Damen! Named after the temperature difference between a raw and well-done burger, 25 Degrees has some pretty hefty burgers, fries, and shakes! I stopped by for weekend brunch to check out two of their newest burgers, the number five lamb burger with tzatziki, red onion, feta, and roasted tomatoes, as well as the number six burger with double beef patties, American cheese, mustard, pickles, caramelized onions, lettuce, tomato, and thousand island! Oh yea, and a side of sweet potato fries, onion rings, and a chocolate banana milkshake for good measure. Tough job I have. 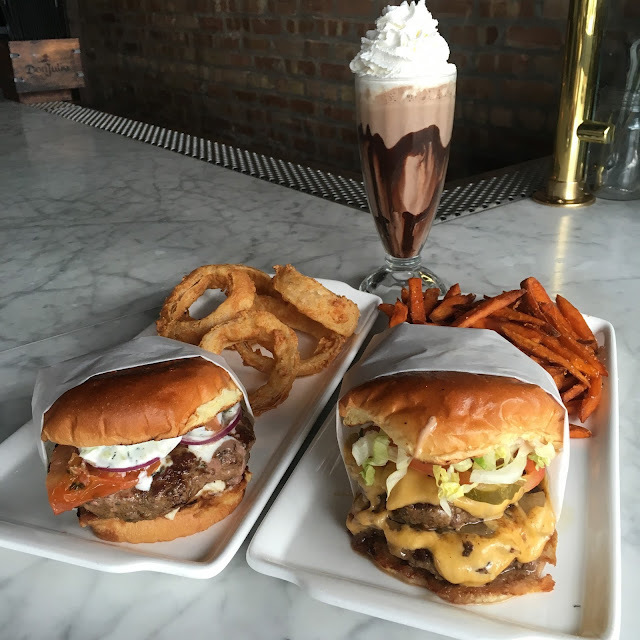 I kid you not, I loved burger five, and burger six just might be my new favorite in Chicago. Yes, I said it. But just look at those photos! They kinda speak for themselves. Some highlights of the menu included a beautiful shrimp ceviche with bell pepper, avocado, cucumber, seaweed salad, orange and grapefruit segments, and wasabi tobiko! While most restaurants these days serve Brussels sprouts, Elixir's pan-seared version includes an addicting sofrito aioli for dipping. They are super crispy, slightly charred, and oh so flavorful! Another hit was the braised beef short rib with sweet potato puree, crispy shallots, and a red wine sauce. It was incredibly tender and the epitome of winter comfort food. I'm a sucker for dessert, and if I go somewhere with bread pudding on the dessert menu, it's all over. Elixir's version featured rich chocolate and caramel, and was extremely warm and gooey. Don't leave without trying it! Elixir is more than just a perfect spot for enjoying drinks with friends, it's also a great choice for dinner. I was impressed with the quality, freshness, and presentation of the dishes I tried, and it's definitely worthy of a repeat Ghost Guest visit! Heads up! There's a new ramen spot opening this week in Wicker Park. 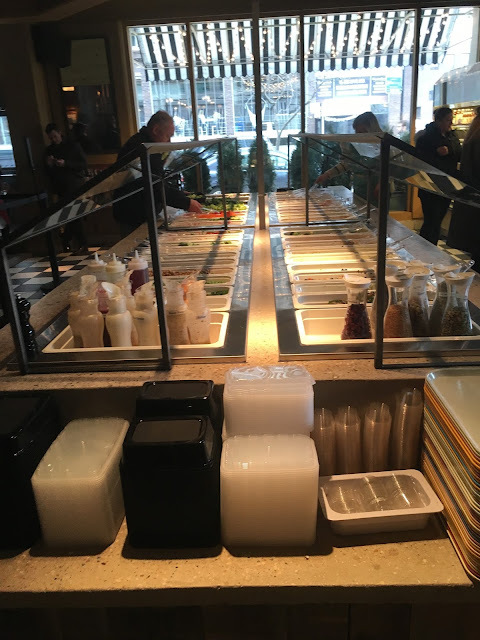 I got a sneak peek of Kizuki Ramen & Izakaya last week which is the first Midwest location for Japanese-based Kizuki. The company was founded in 2003 in Japan and now has more than 20 locations in Tokyo, as well as US locations in Washington and Oregon. 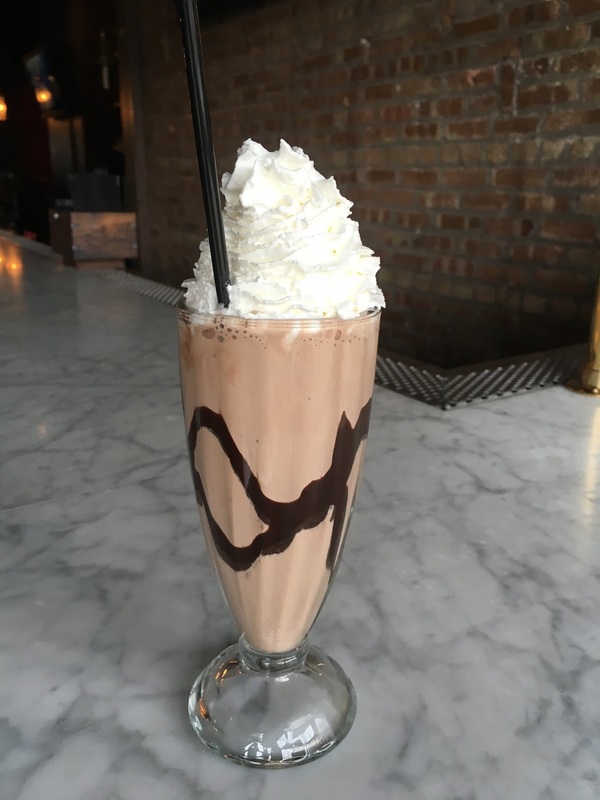 The Wicker Park location is in the former MAX's Wine Dive spot, but you would never know since they've completely transformed the space. It's sleek, modern, and lively. Kizuki offers made-to-order ramen with a variety of broths, toppings, and four different types of noodles. Bowls range in price from $9-13. 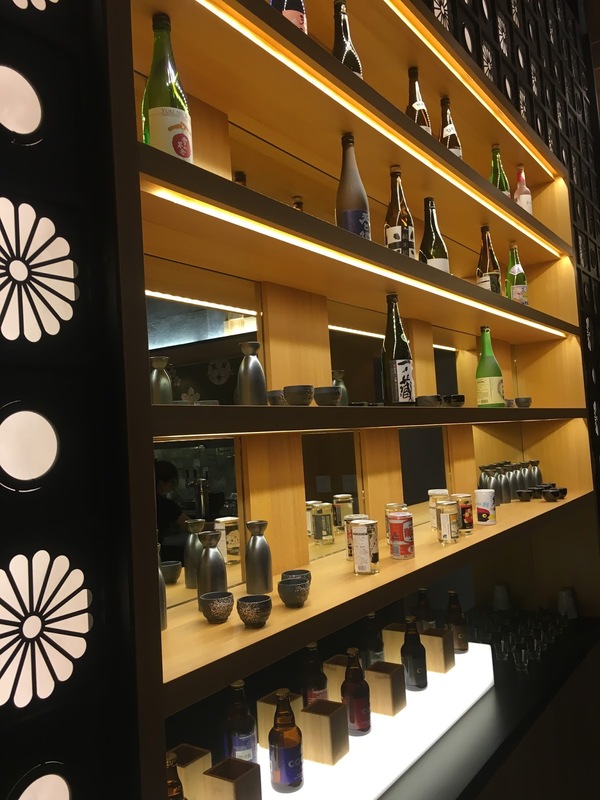 In addition to ramen, they serve 18 izakaya small plates including gyoza, chicken wings, and prawn cutlet, as well as a full bar with sake, Japanese whiskey, and beer. I tried the yuzu shio ramen which featured a citrus, pork, and chicken base. This was a lighter broth than typical ramen but I really loved the citrus flavor. I had never seen a citrus-based broth before! My favorite ramen though was the spicy ramen with a rich pork broth, housemade blend of chilies, garlic, and spices. The broth wasn't too spicy but had wonderfully rich flavor. You can top your bowl of ramen with a variety of extras including egg, bean sprouts, or mushrooms, or swap out ingredients. Kizuki emphasizes how they make their four ramen broths from scratch daily. They first roast chicken and pork bones before making the broth, which creates a rich flavor that doesn't have the gaminess or strong smell that pork can have. 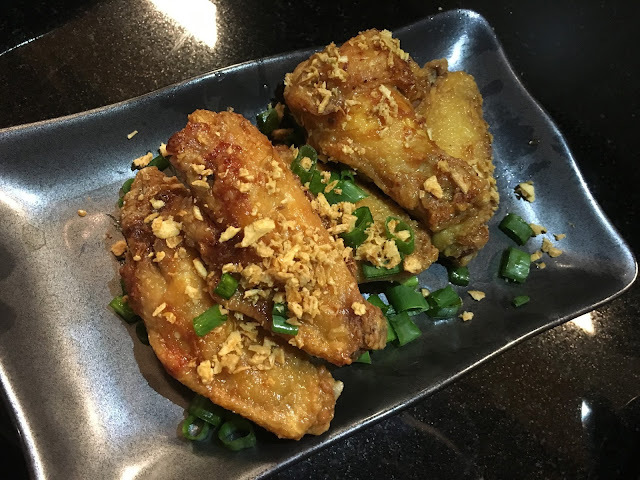 Be sure to stop by Kizuki this Friday, March 4th as they open their doors for lunch and dinner! 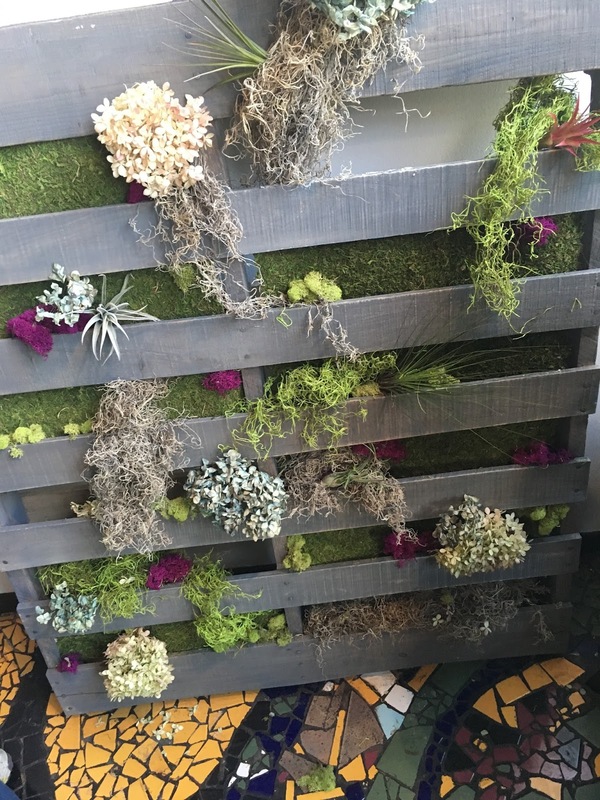 The third time's the charm for Brendan Sodikoff's multi-use space on Hubbard and Orleans. If you'll recall, this space has housed Dillman's, Cocello, and now is home to 3 Greens Market. 3 Greens is a hybrid concept offering the best of Sodikoff's Hogsalt Hospitality venues, plus a hot bar and salad bar. So what can you get? Basically the best of everything: Dillman's pastrami sandwiches, cheeseburgers from Small Cheval, brisket and pulled pork from Green Street Smoked Meats, breads from Bavette's, and coffee and doughnuts from Doughnut Vault! Yes, this is what dreams are made of. Plus there's a bar with wine, beer, and cocktails. It's a great spot for a grab and go lunch, or you can stay awhile in one of the comfy chairs or couches. Think of it as a lunch room/coffee shop/lounge that just so happens to have a putt putt golf green. Go figure. For someone like me who loves everything Brendan Sodikoff does, I'm giving this concept no less than 5 ghosts out of 5! You really can do no wrong here. 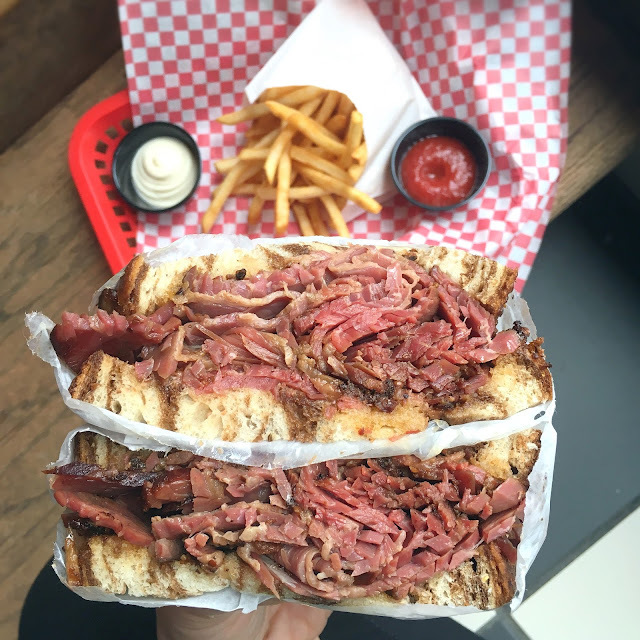 I tried the pastrami and fries and was not disappointed! Note: my meals at Elixir, 25 Degrees, and Kizuki Ramen & Izakaya were complimentary; however, all opinions are my own.